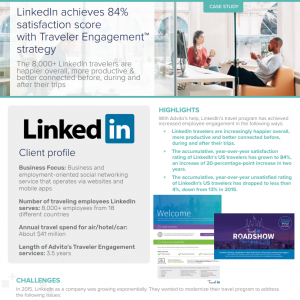 A recently released case study explores how LinkedIn’s travel program tapped into Advito’s Traveler Engagement™expertise to strengthen bonds with on-the-road employees. The result: happier and more productive travelers who are better connected to the company. The engagement effort led to LinkedIn’s traveler satisfaction score among U.S. employees hitting 84%—an increase of 20 percentage points in two years. Advito helped LinkedIn’s travel team create a recognizable travel program brand, TravelIn, that uses mobile, digital, virtual and social media tools to boost traveler awareness, advocacy, loyalty, trust and satisfaction.